The submit button on one of my forms is not obeying the basic formatting that is set on it. It is a duplicate form which may have custom CSS on the submit button on the original form, but I've removed all applicable CSS that I could find and it hasn't resolved the issue. Are you able to identify what is causing the submit button to format differently? It is because the form is using a Theme. 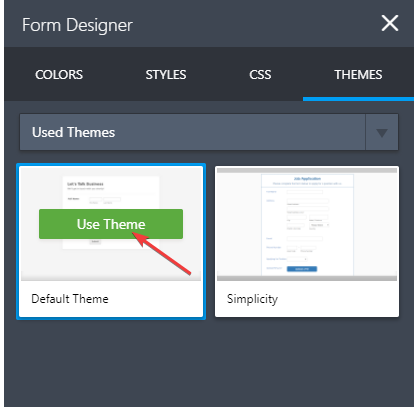 In your form Designer, you can use the Default Theme and use the ADVANCE DESIGNER to be able to better customize your form button. Let me know if you need further help/adjustments.